It’s not often that I don’t give away the vast majority of what I bake. But sometimes I just can’t bear to part with something that Quinn and I both really, really love. That’s the case with these Pecan Spice Muffins. They were just so good that we kept the whole batch to ourselves! If you’re a fan of spices and nuts, then I think you’ll love these muffins just as much as we do. 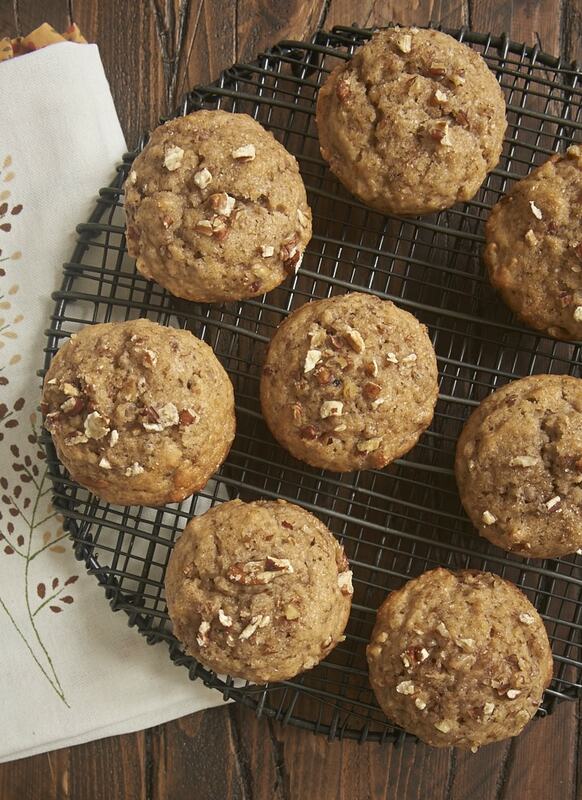 I used my favorite combination of spices to give these muffins a lovely flavor. I like more subtle flavors for muffins and quick breads, as I think that usually translates much better for something you’re likely to eat for breakfast or an afternoon snack. Of course, if you want a bigger spice flavor, add a tad more spice to suit your tastes. Five minutes spent here on BoB will show you that I have a soft spot for pecans. They’re my go-to nuts for baking, and I usually have plenty in my kitchen at any given time. If you prefer a different nut, then feel free to make the substitution. Hazelnuts would be a great choice. Or if you like walnuts, those usually substitute easily for pecans. One of my favorite ways to dress up baked goods is to sprinkle a little coarse sugar on top of them before putting them in the oven. It gives them a little sparkle and an extra bite of sweetness. In keeping with the very brown appearance of these muffins, I used turbinado sugar on top of them. (It’s the brown sugar counterpart to traditional white sanding sugar.) I also reserved a few pecans to sprinkle on top of each muffin to make them a bit more interesting. If you can bear to part with them, a batch of these muffins is great for sharing with family and friends. You can always whip up another batch to keep all to yourself. Visit the Recipe Index for more muffin recipes! 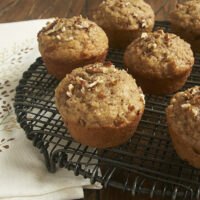 Crunchy pecans and a blend of spices combine to make these fantastic Pecan Spice Muffins! Preheat oven to 400°F. Grease a standard 12-cup muffin pan, or line with paper liners. In a large bowl, stir together the flour, sugar, brown sugar, baking powder, cinnamon, baking soda, salt, ginger, nutmeg, allspice, and cloves. Make a well in the center. In a separate bowl, stir together the sour cream, butter, milk, eggs, and vanilla. Add to the flour mixture, and stir just until combined. Stir in the pecans. If you like, save some pecans to top off the muffins. Divide the batter evenly among the muffin cups, using about 3 tablespoons of batter to fill each about 2/3 full. Sprinkle a pinch of turbinado sugar and a few chopped pecans on top of each muffin. Bake 12 to 16 minutes, or until a pick inserted into the center comes out clean.